Kitchens and bathrooms play important roles in the house. The kitchen is like a substation, where you and other persons in your family rush to whenever they need to prepare something to eat. Bathrooms, on the other hand, are very important, but just like kitchens, they are somewhat useless if they don’t have a faucet that serves them with water. 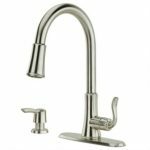 Your kitchen and bathroom, therefore, require the best type of faucet you can get especially if you are someone who uses these two rooms a lot. You also need a faucet that is efficient, a tool that is safe and easy to use, because everyone deserves the best. 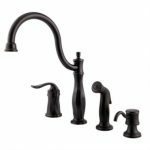 Continue reading Pfister faucet reviews to learn about some of the best kitchen and modern faucets made by Pfister, and perhaps see if you can identify a faucet worth your money. Jaida is a faucet that expresses the elegance and style you only see in top notch bathroom faucets. Its sleek nickel finishing graced by a stunning design can help make a bold statement in your bathroom. Installing it in your house is also easy since you don’t even require a deck plate to help you out. 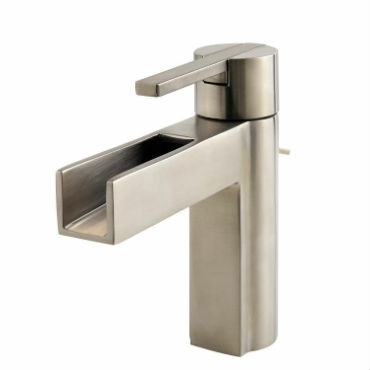 In addition, the faucet is made with modern technology fort both durability and efficiency reasons. This is widely evident in both the advanced ceramic disc valve technology that is leak free and its compliance with CALgreen criteria; another guarantee that Jaida saves plenty of water in your bathroom. In addition, the tool comes with a decorative deck plate for installation purposes and a highly efficient drain system that only requires a little pressing when you need to seal or open it. Its patent installation technology is highly efficient and helps you save time during that process. The tool’s spout reach, on the other hand, is a massive 4.438”, while its spout height is 4.875”. The overall design for Jaida is conspicuous as we had earlier noted. The Pfister Vega looks almost similar to Jaida, except for the fact that its design takes sharp edges rather than soft curves. 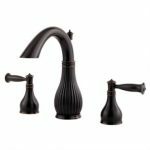 Despite this, the faucet does look amazing, and it would easily match or compliment any type of décor in the bathrooms. And apart from the good angular looks, this tool is a real masterpiece when it comes to performance. The push and seal drain assembly is exceptionally fast and efficient besides being quick to de-clog or re-service. The presence of durable ceramic disc valves helps you have easy control to the water as it is delivered. On the other hand, Vega delivers water at a rate of over 1.5 gallons per minutes, which is quite fast especially if you use a tub most of the time. Since it is also built with a patent technology that helps conserve water, your energy bills would considerably go down after a while. Also, take note that the tool has undergone several tests to prove that it is safe for home use. Among the tests it has passed are lead guarantee compliance and disabled people friendly tests. Lastly, the tool is light in weight and comes with a limited warranty. Ashfield has a simple design, but it is a very strong bathroom faucet that can serve you for months and years. 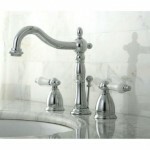 In fact, its unique looks which are borrowed from vintage faucets make it distinctive in a good way. 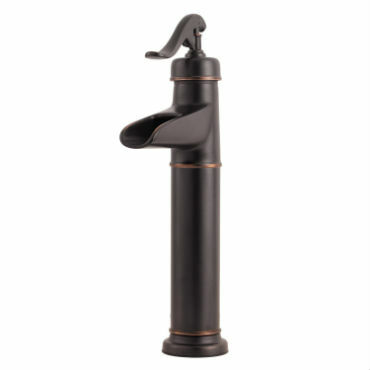 And along with good looks, this faucet is a true masterpiece in serving and delivering water efficiently. It has an average water delivery rate of 1.5 gallons per minute, and the water it delivers is already lead-free if you consider its compliance with the California AB-1953 and Vermont Act 193. 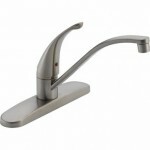 The single hole faucet is also easy to install, while its handle is very comfortable and easy to operate. It lacks a drain assembly system, however, which means that you may need to buy yours for better efficiency. It does have a disc valve for more efficient flow of hot and cold water though. Other notable features with the Ashfield is that it meets EPA water sense tests, great for accessibility with disabled people and comes with a single post mounting ring. Finally, the tool weighs only 5.5. Pounds, it is made of long lasting brass material and measures 0.1*6.7*11.8 inches. 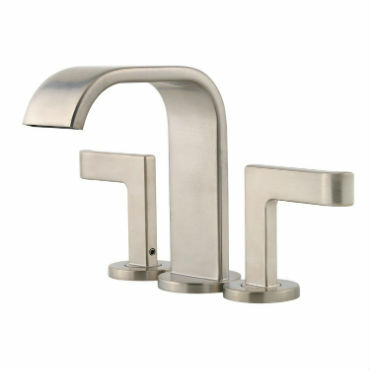 Skye is one of the most elegant bathroom faucets from Pfister makers. Its sleek mini spread design graced by two identical handles gives you house a stylish and striking look. In many reviews, Skye is greatly regarded and praised for combining both creative designing and efficiency. With its beautiful looks which are greatly exemplified by the brushed nickel color, Skye is able to spout well over 4 inches. The water it delivers is also clean if the lead compliance test is something to go by. It is also a friendly tool for the disabled, and its Pforever seal also explains why it is worth your money. Note however that the valve is not leak free, but it is efficient when used appropriately. You may install Skye either on a countertop or inside a sink deck since the faucet is easy to install in whoever method you decide to use. Finally, the faucet weighs only 4 pounds and it can surely last for long if the brass build material is anything to go by. The Pfister virtue is one faucet that really stands out from the rest. Its widespread pot like design is intriguing and distinctive, but it is also very efficient when it comes to giving services. If you install it in any bathroom, Virtue will surely make a bold statement in there. It is built with brass to last, and it can easily fit any modern setting bathroom environments. 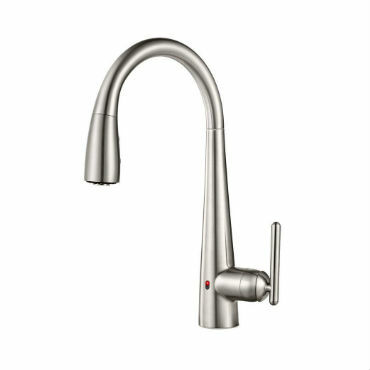 Away from the high arc spout, virtue takes an all metal pop up and lever. It is very eco friendly and has complied with all low lead compliance test requirements. The tool measures 8.47 inches in height, 12.5 inches width and a depth of 3.3 inches. In addition, the faucet delivers water at a relatively great speed, plus it achieves a spout reach of up to 5.19 inches at average pressures. The Pfister Treviso is conspicuously elegant and sleek as evidenced by the bold modern era curved designs. The tool stands imposingly on top of an attached deck, and so are its two handles. Treviso is a true beauty in the house, and the good thing is that you can set it inside any bathroom setting and still stand out. It is also built of brass, which is a strong and durable material. In addition, Treviso comes with three installation holes and a great ceramic disc valve to add efficiency when it comes to accessing both hot and cold water. It is compliant for use by disabled people and water conservation compliant as well. Cagney is a high arc kitchen faucet that represents all the good features people praise in Pfister faucets. The high arc helps increase the water spout reach, while a single handle water flow and temperature control help increase the ease of use to the owner. Cagney’s most notable features also include a Pforever seal that has a never leak guarantee label. If you want to install it, it would only take a short time since the option of using a deck plate is optional. The tool also has a 360 degrees swivel spout, which makes it easier for cleaning large pots and dishes in your kitchen. The Pfister life warranty is another notable feature that proves the manufacturer’s confidence in their product. 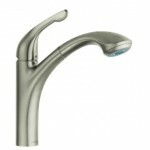 In addition, Cagney Pfister is a lead free compliant kitchen faucet, and it is also very efficient at conserving water. It is a disabled people friendly tool, capable of 1, 2, 3 or 4 hole installation tool and only weighs 7 pounds in weight. Finally, the faucet has a soap dispenser for better cleaning of your pans and pots. 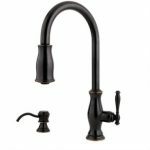 The Lita single handle kitchen faucet is yet another masterpiece from Pfister that has garnered a lot of positive reviews from critics. The tools’ design is also striking; even though it takes the normal high arc shape found in many models. The faucet also has some unique features that make it more efficient than other makes. For instance, it has a 36” integrated nylon supply lines, which eliminates the need to buy your own lines for installation. It is also fast and delivers more water per minute than many kitchen faucets in the market. At a pressure of 60 psi, the faucet is capable of delivering 1.8 gallons of water per minute. In addition, the tool has a react sensor, which is a touchless faucet feature that helps you turn the water on or off without even touching the tool itself. Also, note that Lita comes with a smart stop feature that lets it shut off automatically if left inactive for two minutes. It also has an option for inserting a battery pack, should you not feel like using its plug-in feature. Among the many Pfister reviews, Hanover has always received high acclaim due to its conspicuous beauty and incredible functionality. Its Tuscan bronze color makes it look unique and elegant, while its comfortable and soft handle makes your kitchen experience with the tool remain memorable. The faucet can either come with 2 or 4 holes for installation purposes. In addition, Hanover comes with its own range of unique features like the anti-splash volume control spray head that is compatible with multiple hole sinks, a for life function and finish warranty and a 360 degrees rotating spout. It delivers water at a 2.2gpm rate and weighs only 8 pounds. 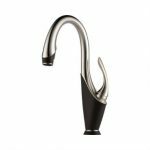 This faucet takes the idea of high arcing to a new whole level as its arc is mounted onto an already long stand for a better spout reach and space when cleaning bigger pots and pans. Its functionality is also admirable, as it has a range of unique features that are all meaningful in one way or the other. To start with, it has a decorative side spray, swiveling spout and a water delivery rate of 2.2 GPM. The faucet is also ADA compliant, which means that even disabled persons would use the faucet comfortably. Additionally, Hanover is also compliant with California and Vermont laws against lead issues. 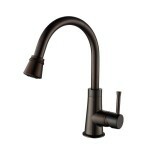 Finally, the faucet has a great faucet reach with its high arc designs and weighs only 5 pounds. 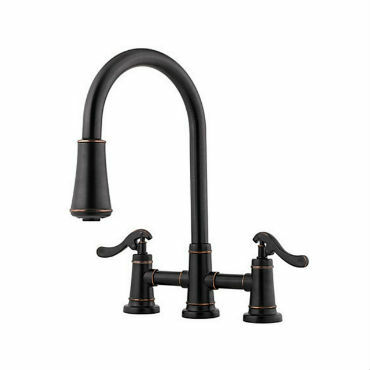 The Ashfield kitchen faucet is unique in many ways. 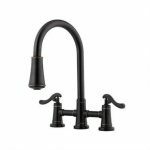 In fact, everything about the faucet is striking, starting from the high arc graced with two identical handles that are connected to the faucet by a crossing bridge. It is a low lead compliant tool, supports a three hole bridge pull down spout and comes with an amazingly efficient anti-splash spray volume control. 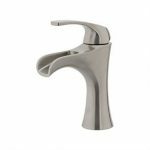 Additionally, the faucet has a ceramic valve for more efficiency when using hot or cold water and is built out of a strong brass material. And like many Pfister kitchen faucets, this model has been a success in the market. It measures 9*10*13 inches and weighs only 3.1 pounds. They are striking and beautiful- Pfister is a master in designing faucets. Just one glance at one of their faucets and you feel comfortable buying the tool for your house. 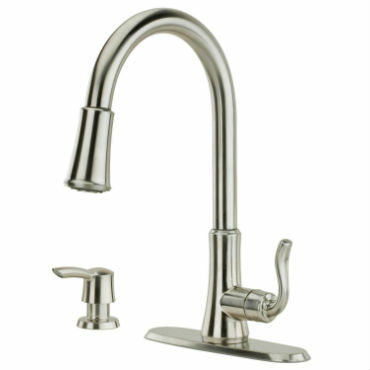 They are affordable- Though Pfister faucets are not the cheapest in the market, they are generally affordable. They also offer great value for your money if you consider the great functionality that comes with their products. 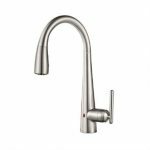 They are easy to install and use- Almost all Pfister faucets are easy to install. Their deck plates in most cases are for decorative purposes, and rarely do you find people asking for help to install these faucets. Life warranty- The presence of a life warranty in functionality and finishes in many of Pfister faucets is a great feature that assures customers that they are buying a good product. The faucets are also compliant with both ADA and water conservation departments; which should add confidence to any buyer out there. Some ceramic valves in Pfister faucets leak a lot. And although most of the leaking tools have a label warning against the same, it is a frustrating experience to many Pfister product lovers who show a lot of loyalty to these products. Some Pfister faucets have slow water delivery rates. Everyone has a reason for buying any particular type of product in the market, but when it comes to choosing a great faucet for your bathroom or kitchen, Pfister gives you every reason to trust their products. 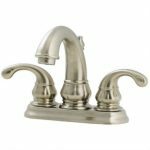 Take a moment and think about anything you ever wished for in a kitchen faucet and then look back at all the Pfister faucet reviews done above. In most cases, you will find a tool that meets all your requirements. Pfister tries to mix both good designing and incredible functionality in every product they produce because everyone wants to invest their money where they can see value for it.